Enrico Crispolti, the main Italian art critic of his generation, passed away last week. We honour his memory with an interview that Italian politicians should carefully read. 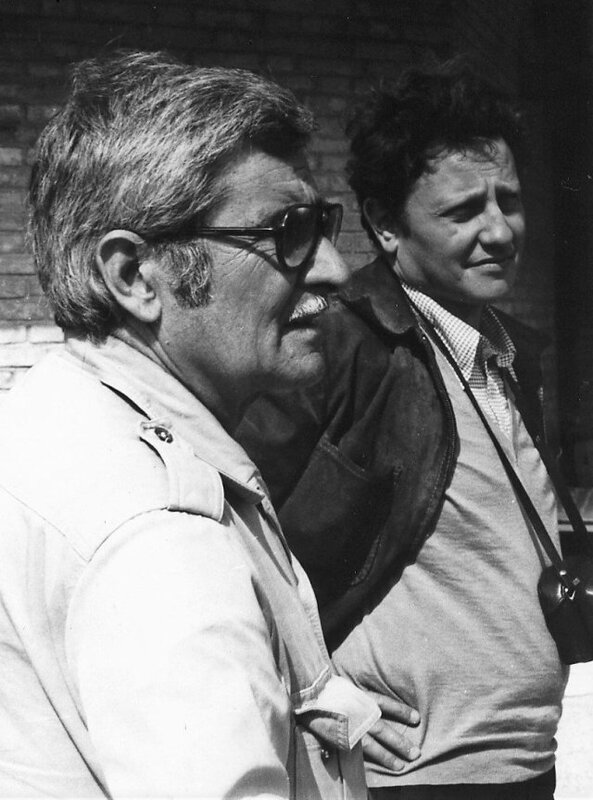 Alberto Burri and Enrico Crispolti (on the right), 1974, Città di Castello. Our tribute to Enrico Crispolti, who passed away last 8th December, is the first English version of the interview Crispolti gave to the authors of ‘Scene da un patrimonio’, a book published in 2013 in Italy whose ambitious aim was to offer politicians a tool to overcome the deep crisis Italian Cultural Heritage was, and still is, going through. Enrico Crispolti was and will remain the most reliable reference point for scholars, art critics and curators, both on a scientific and ethical level. Like many European country’s public cultural institutions, also the Italian ones are struggling to cope with the increasing inequalities. Therefore, long live the thinking of a master who has still much to say about our future. From the end of the Sixties up to today, how do you think the attitude of Italian politicians towards cultural heritage has changed? During the Fascist regime, culture was a matter the State took charge of. Artists played a role and indeed counted in society. It was soon after the Second World War that the State effectively starts to lose interest, giving up on any sort of debates planning-wise. In the Seventies our political consciousness, that is that of cultural professionals, was strong. We thought we could embark on a dialogue even though politics wasn’t that much present as we instead tend to believe nowadays. Pci (the Italian Communist Party) feared that from topics like involvement, or from the will to be “in the city”, we would slip into armed struggle. This actually brought about narrow-minded behaviors from its part. However, there were some enlightened minds, also outside the left-wing, hence things happened, sometimes even very well. Today, on the contrary, besides certain circumstances, it seems to me that politics is completely missing and so is the interest of the “professionals” to go and look for the most appropriate interlocutors. During the Veltroni administration in Roma, we tried to sensitize the city politics to the implementation of the famous “law of the two percentage”, whereby 2% of the resources employed for public works were to be allocated for the decoration of the very same. But we didn’t achieve any result. It didn’t really go any better with Francesco Rutelli, to whom Rome owes the’ wrapping’ Richard Meyer designed for the Ara Pacis. This latter was a decision reached far from the cultural debate and what’s more without even a competition announcement. Was it the same for the MAXXI in Rome? I would say that Giovanna Melandri is better than that that could have been worse, and everyone would cherish if she managed to gather the funds needed. Right now rumors say Carolyn Christov Bakargyev will be appointed as new director. I don’t believe she is the right figure for that. We need independent and fresh minds, not reactionaries disguised as revolutionaries. Otherwise institutions, which should be free and authoritative, end up becoming the mouthpiece of the market, with all that that implies. What is contemporary art needed for? It’s a research on the knowledge of reality and on how to view the world. It’s as useful as science. Is it true that art, to be good art, shouldn’t care about money? Art needs resources because it matters a lot for society, and it matters because it produces knowledge. How much did Jackson Pollock, Alberto Burri or Lucio Fontana teach people about the world? They have managed to instill hope more than many politicians who back at their time used to talk about the future. It may sound like a joke but…’the sun of the future’ did set. Whereas Fontana didn’t. Before Giovanni Spadolini the Ministry of Cultural Heritage and Activities functioned under the Ministry of Public Education. There is currently a debate on whether to reform it and if so, how; according to some people there should be a more harmonious cooperation with the other Ministries. I also believe this to be the best path to follow, while keeping in mind that nowadays education is no longer a unilateral transmission of knowledge as it used to be. It is rather creation of experience. University professors – similarly at lower levels – are aware that they can obtain much more from their students if they are able to engage these latter to actively participate in learning. It isn’t anymore about conveying a piece of information to someone who doesn’t know, rather it’s about sharing long-standing experience, based on participation and dialogue. Before there used to be the myth of know-it-all; nowadays it’s no longer the case. We are conscious we only know a bit of the whole. The same should be valid for inter-ministerial relationships, and for the citizens. I agree with Salvatore Settis when he asserts that the real guardian of the Italian monumental heritage should be the very same citizen. How do you think the way to perceive exhibitions in Italy has changed? Often exhibitions have become a business, thus drawing the attention of people who have never really dealt with culture before. The same figure of the curator, who seems to me a sort of mercenary wandering around in search of money, is the direct effect of this system. We reached that point when if you give a reasonable estimate for an exhibition, you are told that it is of no interest. However, if you suggest overwhelming figures for a show, then the interest immediately arises, regardless of the project. Moreover, museums in Italy don’t do research, and don’t have medium-term planning. The Guggenheim will host a major exhibition on Futurism in 2014; I know of an eminent scholar who has been going around for the past couple of years, talking to everybody in order to learn, understand and find the best materials for the first comprehensive overview of Italian Futurism to be presented in the United States. Here, on the contrary, museums like the Galleria Nazionale d’Arte Moderna in Rome, or the Museo del Novecento in Milan – which, let me say, has been horrifyingly set-up – play it by ear. Thus, it happens that the museum doesn’t know anymore why it should hold an exhibition and how to do it. Indeed they are needed, yet they should be figures who are born within the museum or the institution itself. In Italy the only successful example I am aware of is Gabriella Belli who has actually started from history of art, and understands very well the importance of a bond with the territory. Something that neither Danilo Eccher, nor Luca Massimo Barbero have been able to grasp at Macro. What’s the point of inviting international artists to exhibit, when the museum is dedicated to Roman artists? The aim should be supporting local artists in establishing a dialogue with other local artists who don’t necessarily live in Rome but maybe live in London or New York. Thus the museum is consistent with its objective, that is promoting its own culture. It is about creating spaces for exchanging views, and this is what council member should do too. Providing the field, together with all that’s needed, yet letting the players play the match. You have devoted your life to teaching: from the Accademia di Belle Art in Rome to the university and school of specialisation in Siena. How do the new generation of students look like? I have a two-year-old granddaughter and I am amazed by how fast she learns. The same happens with the students who, to me, seem smarter, better informed, yet culturally less equipped with resources, if compared to some years ago. I think the quality of the educational facilities has decreased, and I believe the reason can be spotted above all in the impoverishment of public schools which coincides with the weakening of the Government. Are young people better informed thanks to the web? Yes, of course. If the State doesn’t want to give up its educational role altogether, this is really where it should be more involved, also as far as artistic culture is concerned. For instance, the prestigious guidebooks “Guide Rosse” (Red Guides) from the Touring Club of Italy, as well as the History of contemporary art edited by Fratelli Fabbri Editori, have been great works of knowledge which however don’t find any response online. Yet, hundreds of expensive catalogs which none reads are still published. This is where the future of this discipline is put on the line, together with the very same idea that the citizens have of the State. The power has to be central, but then the local should be able to do its part, autonomously.